Are you currently facing a family law matter in Arizona? Our Arizona family law attorneys understand the stress, emotional exhaustion, and fear you may be experiencing. As such, the moment you contact our Arizona family law firm, our Arizona family law attorneys will do everything in our power to help you obtain the sense of ease you deserve. The supportive assistance and personalized legal solutions of our Arizona family lawyers will help you navigate the complexities of the Arizona legal system. Secure our representation today to receive the effective legal counsel you need to successfully resolve your case. Our experienced family law attorneys have obtained exceptional results for our clients through aggressive representation, superior knowledgeable of the law, and a sensitivity to the needs of our clients throughout Arizona. Divorce and child custody issues take their toll and come at a great expense, both emotionally and financially. Our lawyers use a variety of means of conflict resolution, including: arbitration, mediation, and, when necessary, litigation. No matter the size of your dispute, your case is our priority. We minimalize costs and respect those costs as we are sensitive to what both our clients and their family has to endure. In addition, we believe that one of many strong points of each of our family law attorneys is their communication skills. We also believe in building a good rapport with each of our clients so we know their individual preferences and needs. A better knowledge of our clients, their situation, and the applicable law allow us to more efficiently settle their family law needs, or present them to the Arizona Family Court for resolution. 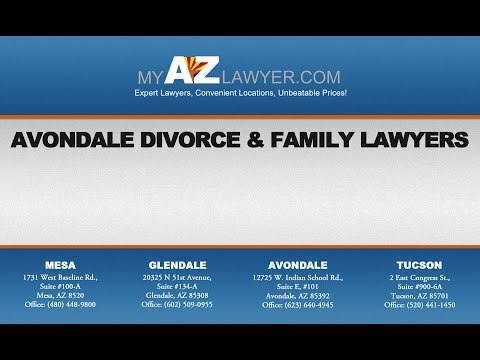 When representing family law in Avondale, Phoenix, Tucson, Mesa, and throughout Arizona our family law lawyers and family law staff view our obligation to our clients as working in conjunction with our clients and helping them bring order back to their lives by alleviating their family law issues. When it comes to family law issues in Phoenix Arizona, we believe that personal compassion and legal expertise are needed and necessary. Lastly, email My AZ Lawyers today to schedule an appointment at one of our Phoenix area or Tucson law offices. We also offer free, no hassle, no obligations consultations. As well as, affordable payment plans.